After the Jacobite defeat at Culloden ‘Bony Prince Charlie’ faced capture unless he could escape to France. While British government troops were searching for him, he sought refuge in Uist. His supporters wanted to smuggle him from Uist to Skye, and then onto a boat to France. Flora agreed to help them. 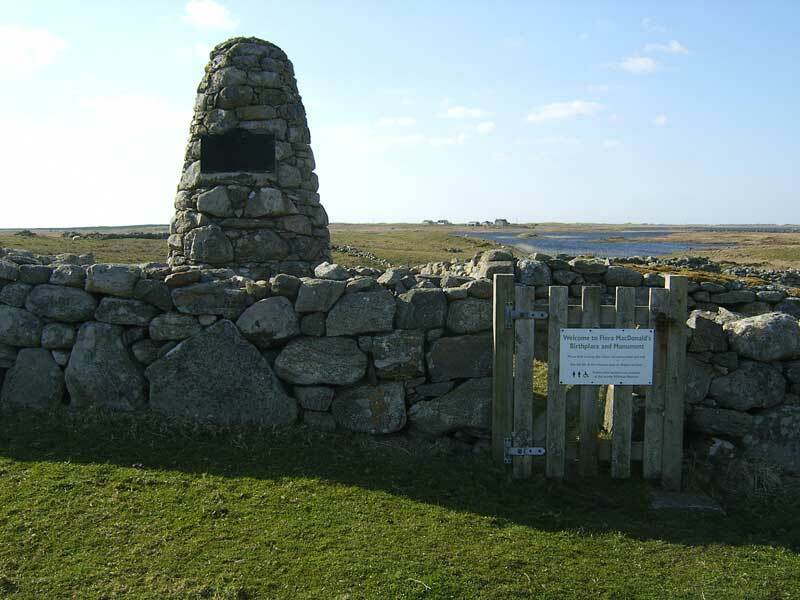 On 28th June 1746, Flora MacDonald and her Isish maid ‘Betty Burke’ sailed from Benbecula over the sea to Skye. The maid was the thinly disguised ‘Bony Prince Charlie’ and the event is commemorated in the famous Skye Boat Song. For her part in this bold plot to help ‘Bony Prince Charlie’ escape to France, Flora was arrested and imprisoned in London. After her release in 1747, she returned to Scotland. The plan on the monument shows what is believed to be Flora’s house, although some believe this not to be the case.